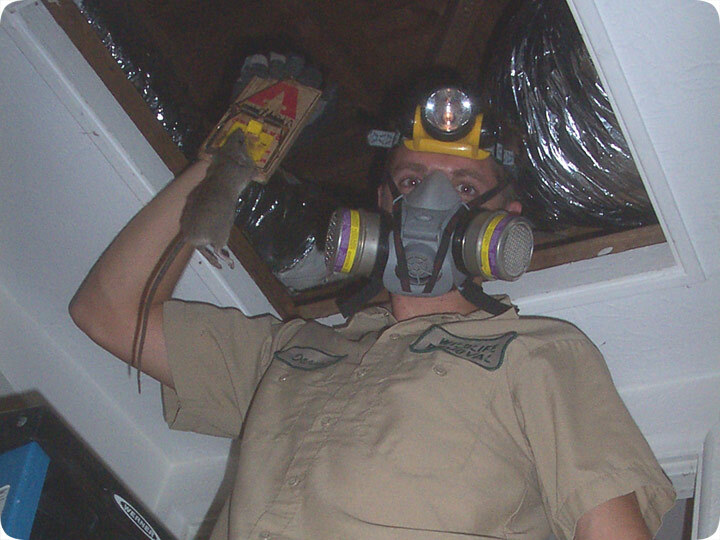 03.29.2004 - This is one of the most common jobs that I do - removal of rats from the ceiling of a home. The phone call always starts out the same: "I hear noises in my attic!". I then ask the customer to describe the noises. Several different animals live in attics, but if the description is of a quick scurrying, the pitter-patter of little feet, and particularly up the walls in addition to the ceiling, then I know it's rats. The primary problem that people have with rats in the ceiling is the noise. However, people don't know about the other dangers of having rats in the ceiling. Rats are rodents, and thus they like to chew in order to wear down their teeth. They often chew on things that we'd rather not have them chew on, such as electrical wires or plumbing. In addition, rats carry a number of diseases which can be spread to people and pets. Once rats find an attic, they leave a scent behind that attracts new rats, so the problem never stops unless it is properly addressed. Rats often seek out ceilings to live in for many reasons. The primary reason is for a warm, safe, dry, place in which to live. The rats can smell the air of the attic, they can detect the airflow with their whiskers, and they know that there's a cavity in which to live, so they work hard to get in. They use ceilings as a place to spend their time when not foraging. They also use attics as a safe place in which to create a nest to have and raise their young, as do many different species of animals. The particular rat in this photo, the Roof Rat, loves to live in ceilings in particular, since this rat likes to live in high places in general. I spend a lot of my time climbing in and out of attics. In the above photo, I'm standing on a stepladder. When I come to your home, if you have an attic hatch with no pull-down ladder, I bring in the stepladder. I have no problem pulling myself up into attics. Once inside, I take great care to walk lightly, on the beams, and I never step on the ceiling drywall, because I could fall through. It's best to have a light person do work in attic spaces. I can climb all around in the hardest-to-reach areas, and move around like an animal myself, safely causing no damage. I always wear a mask, such as in the above photo so that I don't breathe in insulation fibers or airborne pathogens. If you want to solve a problem with rats in the ceiling, you should give me or another wildlife expert a call.